Ok so this weekend has rocked. I didn’t go to work at all and instead we all went to AWA-con (Anime Weekend Atlanta) In costume. It was one of the best feelings to look just like my absolute favorite character and wave around this huge pirate flag. Me, Brian and Andrew were Luffy, Zoro, and Sanji from One Piece. Though Brian and I were always walking around together Andrew was off on his own most of the time. Then we met up with Beth and Jeff and hung out and I got stuff and more stuff. 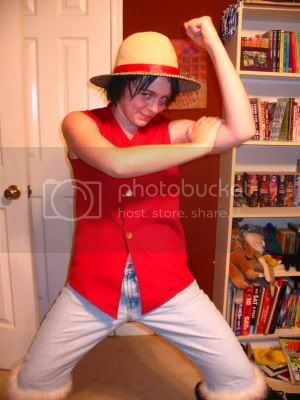 Honestly, I am looking though pictures and I say I looked just like Luffy. It is so cool. See? Now I can restfully spend the rest of the day sipping tea and working on the extended essay. 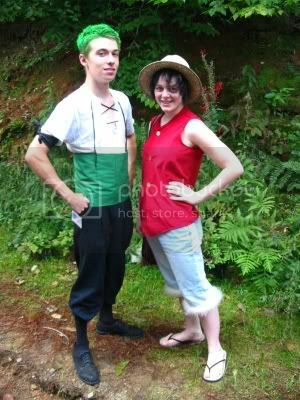 There we are, Luffy and Zoro. Yaayyyy! This was written by Hannah. Posted on Sunday, September 26, 2004, at 2:27 PM. Filed under Life. Bookmark the permalink. Follow comments here with the RSS feed. Post a comment or leave a trackback. hehe that’s too great Hannah! Tell Brian to stick with green. It’s a very manly color. i agree. very much so. i was wondering if you were there sunday? I was yuki with, *intersting* pics with my shuichi. 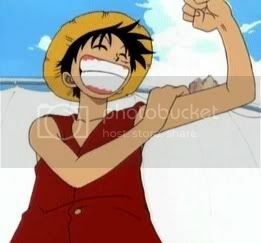 You make a GREAT Luffy! Snazzy fluff on those cut-offs!